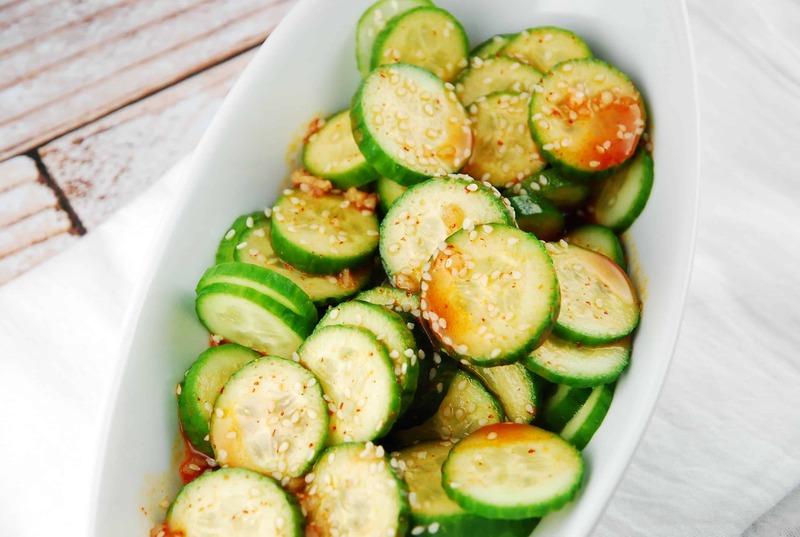 Spicy, savory, crunchy and absolutely delicious, this low calorie cucumber salad makes a great Weight Watchers side dish recipe, or even as a healthy late night snack. It’s super easy to throw together, and the unique flavors are a welcome surprise. Combine all ingredients except the cucumbers and sesame seeds together in a small bowl. Place cucumbers in a serving bowl, and pour dressing over them. Toss well to evenly coat. I am only seeing one pp in this whole recipe….unless siracha has points? Just so you know, I CANNOT stop eating this! I’m a big fan of the standard cucumber/onion/vinegar salad, but this has become my new favorite thing EVER. I’ve been making it in mason jars and leaving it in the fridge for a snack. Thank you! Made this tonight! I LOVE cucumber salad and this spicy twist on a classic. My son is allergic to sesame, what can I use instead? You can just skip the sesame seeds and sub olive oil ins tread of the sesame oil, though the taste will be a bit different. Still delicious though! Love the looks of this salad! Have never heard of Persian cucumbers, but I usually buy English cucumbers. They are long and thin, and so perhaps a good substitute for the Persian ones. Until today, I had never heard of Sriracha sauce. Is there another well-known sauce I can use as an almost-as-good substitute (which I hope to have on hand), so that I don’t have to go out and purchase yet another bottle to put in my already overloaded refrigerator? If not, I will go with it. Thanks so much for all of your well thought out recipes. I so enjoy getting them in my e-mail. English cucumbers work just fine in this dish too! Really, any kind of cucumber will work, so if that’s what you have on hand, no need to go out and buy more. As for the siracha sauce, it’s a pretty unique type of hot chili sauce. If you don’t want to buy a bottle, just stop buy any Chinese food restaurant and see if they have any packets of them on hand. Since you only need a bit for this recipe, a couple packets are all you need. You could even ask for a little condiment cup with a lid to squirt some in, if they don’t have the packets. That is such a good idea – Unfortunately (depending on how you look at LOL) we have a good Chinese buffet nearby and I think I did see that. Thanks for the tip. Is this the same stuff sushi resturants give out IV been trying to find a recipie and was wondering if this is the same thing?